…Which is why the attitudes and words of those writing our world’s history matter; why social sciences, humanities, and languages matter (and not just STEM); why diversity, inclusion, and empathy matter. Solomon, Rivers. An Unkindness of Ghosts. Brooklyn, NY: Akashic Books, 2017, p. 327. I first became aware of Adrian Tchaikovsky when he won the Arthur C. Clarke Award in 2016. I’ve been meaning to check out his writing since then. Ironclads, a limited-edition hardcover novella, finally made it to the top of my TBR pile last month. The version of U.S. in the story is fighting in Scandinavia, and, due to having laxer laws on genetic modification, Finland apparently has become home to very interesting types of special forces. “[F]or a long time I couldn’t even work out what was on her screens. Then it started animating, frame by stilted frame, and I worked out that some parts of what I was seeing were a satellite view. The vast majority of what should have been contested Swedish soil was smeared with roiling dark clouds that obscured any sight we might have had of what the enemy was doing. “’Is that the flies?’ Lawes asked gloomily. “’They bite?’ Franken asked uneasily. 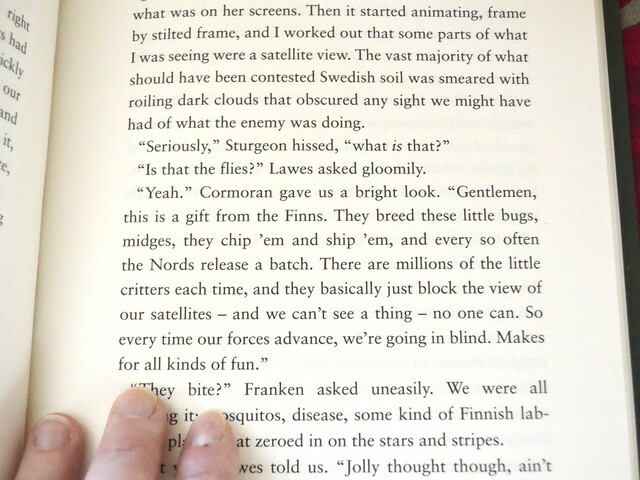 We were all thinking it: mosquitoes, disease, some kind of Finnish labgrown plague that zeroed in on the stars and stripes. It makes perfect sense in a world with aggressive biological research to turn a ubiquitous pest into an asset. Come to think of it, it sounds very much like the strategies that Finns used in the Winter War of 1939-1940 against Soviet forces—making native conditions work for you and against the enemy. Of course, no one person can disapprove or approve of any characterization on behalf of their whole group. However, in My Official Opininon As a Finn, Tchaikovsky managed to balance well the view of Finland as part of Scandinavia with Finns being distinctly different from their Swedish, Norwegian, and Danish cousins. Also, he got so many little details right, like the way the Finnish language sounds, or our deep appreciation of nature. I practically tore through the book. Kudos! Tchaikovsky, Adrian. Ironclads. Oxford: Solaris, 2017, p. 22 and p. 29. A feature-length indie scifi-western Prospect, written and directed by Zeek Earl and Chris Caldwell, premiered at the SXSW festival in March 2018. The movie stars Sophie Thatcher, Pedro Pascal (whom I’ve seen in Game of Thrones and Kingsman: The Golden Circle; he is also slated to appear in Wonder Woman 2), Jay Duplass, Andre Royo (appearances in Agent Carter, Elementary, and Fringe), Sheila Vand, and Anwan Glover (also visited in Elementary). The runtime is about 1 h 40 min. About a month ago, in early May, Variety announced that Gunpowder & Sky (who bought worldwide rights to Prospect) will release the film theatrically in the U.S. later this year. It looks also to be available for streaming on SingularDTV at some point. Until then, according to the movie’s Facebook page, it looks like Prospect will be playing at select film festivals and/or independent theaters. Sounds intriguing—has anyone seen this yet? Thoughts? Roxi tweeted a question, and we have answers! 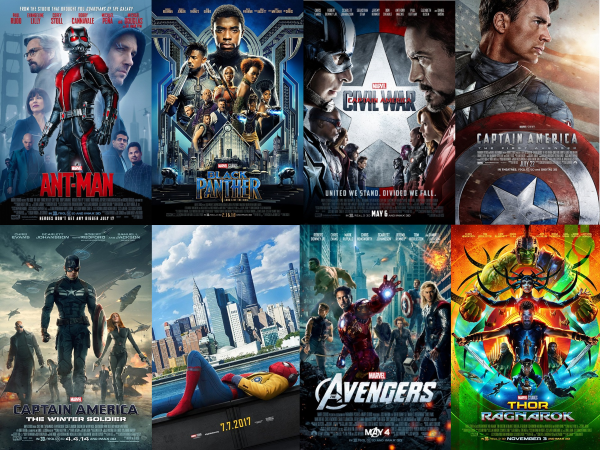 My honorable mention is a tie between Ant-Man (which surprised me positively but ultimately won’t make the list due to the annoyingly large serving of ham for a villain) and Thor: Ragnarok (Jeff Goldblum was a fun villain but he shouldn’t overshadow the rest of the fantastic ensemble). We suspect our lists will look quite different after this summer (with AIW now and Ant-Man and the Wasp due in July), but we’ll see. Images via IMDB: Ant-Man. The Avengers. Black Panther. Captain America: Civil War. Captain America: The First Avenger. Captain America: The Winter Soldier. Spider-Man: Homecoming. Thor: Ragnarok. Good grief, I’ve completely lost the track of time—here in the U.S., Avengers: Infinity War opens this Friday (April 27, 2018). Eeeeek! However, it looks like we’re possibly in for quite a treat. I cannot see a mashup of all of the super-and-super-adjacent-heroes being anything but a Learning to Work Together story, at least to some extent. The setting of AIW also looks a lot like the setting for The Avengers, which I liked quite a bit (even despite its Smurfette-action). There’s nothing quite like repelling a force with unknown capabilities more numerous than yours to have our heroes pull together. I’ve liked the Russo brothers’ Community episodes and previous Marvel Cinematic Universe movies from well enough to a lot, so I doubt I’ll be disappointed in the directing. The same more or less goes for dynamic screenwriting duo Christopher Markus and Stephen McFeely: the Captain America movies The First Avenger, The Winter Soldier, and Civil War are at the top end of their work even if I’d prefer a lower amount of testosterone in my superhero stories. One thing’s sure: it will be fabulous to see people from the Black Panther again (especially Okoye and Shuri!). I’m also curious to see how they’ll integrate the Guardians of the Galaxy characters. And we know already that there will be humorous quips! Images: When you said we’re going to open Wakanda to the rest of the world gifs via Daily Marvel Heroes on Tumblr. This new movie adaptation of Ray Bradbury’s novel is by writer, director, and producer Ramin Bahrani. The flick stars Michael B. Jordan (lately appearing e.g. in Black Panther and Fantastic Four) and Michael Shannon (e.g. The Shape of Water, Batman v Superman: Dawn of Justice, and Man of Steel). It’s set to come out May 19, 2018. My first snarky comment solely on the basis of the trailer is “Do you think this movie has something to do with fire?” and the second “My goodness, so many men doing man things—where are the women?” Then again, I know that trailers always lie, and that may be the case here. According to IMDB, at least, the cast does have a number of women, including Sofia Boutella, whom I remember from Kingsman: The Secret Service. It remains to be seen how much of a role they’re given. And I hope Michael B. Jordan is given space to show his depth. “The habs, hives, and hells [i.e., city state -like population centers] compete for economic power, and economic power ultimately comes from populations. A free market requires free movement of population, so everyone is free to basically vote with their feet. If they don’t like the quality of life in the hab, hive, or hell they live in, they are free to move to a different one. A hab, hive, or hell with a shrinking population knows that it better change its quality of life offerings if it wants to stop hemorrhaging people. Aah, I like it too. 🙂 Plus, voting with your feet is a natural extension of voting with your wallet. Myer, Ilana C. “Kelly Robson on the Economics of Time Travel in Gods, Monsters, and the Lucky Peach.” Barnes & Noble Sci-Fi and Fantasy Blog, April 02, 2018. We are headed to see A Wrinkle in Time. It’s delightful to have many interesting picks in the theaters this spring after a year of mostly meh. Pacific Rim Uprising is directed and co-written by Steven S. DeKnight; other writers credited with the screenplay are Emily Carmichael, Kira Snyder, and T.S. Nowlin. I have seen some of DeKnight’s writing and directing for Dollhouse and possibly even story editing for Buffy the Vampire Slayer. The rest of the writing team are entirely new to me however (apart from having at least heard of one of Snyder’s latest producing credits, The Handmaid’s Tale). While I’m mostly not in the mood, now and then I like lots of smacking monsters around and busting buildings. But not only that—destruction without a reason gets tiresome faster than you can say marmalade sandwich. Among the falling skyscrapers and lurching jaegers in these trailers I’m left wondering about the human stories. I really hope Uprising will be a case of Never Trust a Trailer, and the movie will be at minimum tolerable. Granted, the first trailer is more people- than fight-heavy, so that’s a reason to stay positive. At the very least we’ll see more of Rinko Kikuchi, John Boyega—looking forward to seeing what kind of depth he has—and Tian Jing, whose performance in The Great Wall I enjoyed but for whose character there was pitifully little to do in Kong: Skull Island. It’s just over two weeks ’till A Wrinkle in Time opens at theaters (March 09, 2018). The movie is based on a young adult novel of the same name by Madeleine L’Engle. It was first published in 1962, and starts a series called Time Quintet. The adaptation was written by Jennifer Lee (of Frozen and Zootopia fame) and directed by Ava duVernay. A favorite actor I’m most looking forward to seeing is Gugu Mbatha-Raw, whom I loved in Doctor Who as Tish Jones (Martha’s sister) and Belle.